While couples in neighbouring France could dine in restaurants without fear of being frowned upon by their peers, the eateries of Victorian England were a far more restrictive environment. At the top end of the market, they were dominated by gentleman's clubs, which naturally did not admit women. 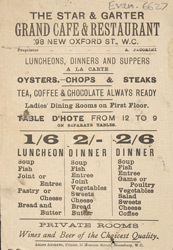 At the bottom end were working-men's cafeterias, which seldom admitted women either. Women thus tended to eat or entertain friends at home. This restaurant is emblematic of the late-Victorian trend towards mixed eateries: the Star and Garter had a separate dining room for ladies.